Lt. Gov. John Fetterman is collecting feedback on recreational marijuana legalization. Are you for legalization? Against legalization? Submit your thoughts. Lt. Gov. John Fetterman is collecting feedback on recreational marijuana legalization. Submit your thoughts. 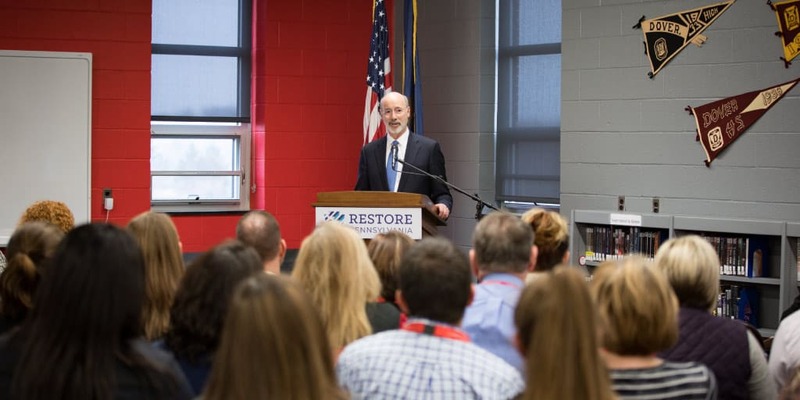 Dallas, PA – Governor Tom Wolf today visited Misericordia University’s Ruth Matthews Bourger Women with Children Program to outline his bold budget plan to create the strongest workforce in the nation. The governor’s Statewide Workforce, Education, and Accountability Program (SWEAP) will provide opportunities for Pennsylvanians from birth to retirement, including $5 million in funding to support single parents in post-secondary education. Governor Wolf was joined by Representative Karen Boback, a Misericordia alumna. The governor unveiled SWEAP in his 2019-20 budget on Tuesday to provide opportunities for Pennsylvanians from birth to retirement. The plan expands access to early childhood education, increases investments in schools, and partners with the private sector. • Provide $5 million in support services via Parent Pathways, so low-income parents get the education and training they need for better jobs. • Invest in high-quality child care and reduce waiting lists so parents can work. • Expand home-visiting programs for at-risk pregnant women, infants and toddlers. • Make sure kids are in school by age 6 and stay until age 18, and their teachers earn at least $45,000 per year. • Connect teachers with businesses so classrooms are preparing students for today’s workforce. • Expand PAsmart with additional investments in apprenticeships and Continuing Technical Education. • Provide one-time grants for community college students who are working in Pennsylvania. The governor will also create the Keystone Economic Development and Workforce Command Center to bring together government, schools and industry like never before. The departments of Community and Economic Development, Labor & Industry (L&I), and State will work with external leaders including Chamber of Business and Industry President Gene Barr, and AFL-CIO President Rick Bloomingdale. The governor wants to find innovative solutions that close the skills gap and rapidly meet the needs of employers. While at Misericordia, the governor and elected officials toured the Women with Children Program’s Moffett House – one of three campus housing locations for program participants. He met with women in the program and learned more about how it is helping them manage their college careers while still having time to focus on being a mother. “With almost two decades of experience, there is nothing theoretical about this program,” Senator Lisa Baker said. “State officials were obviously much impressed by what they saw and heard when they visited last year. Find more on the Misericordia Women with Children Program here. Learn more about Gov. Wolf’s 2019-29 budget at budget.pa.gov. On January 20, 2015, Tom Wolf was sworn in as Pennsylvania’s 47th governor. Since taking office, Tom has taken a number of steps to make Pennsylvania a better place and is fighting for Pennsylvanians in Harrisburg every day. Sign up for Governor Wolf's newsletter.